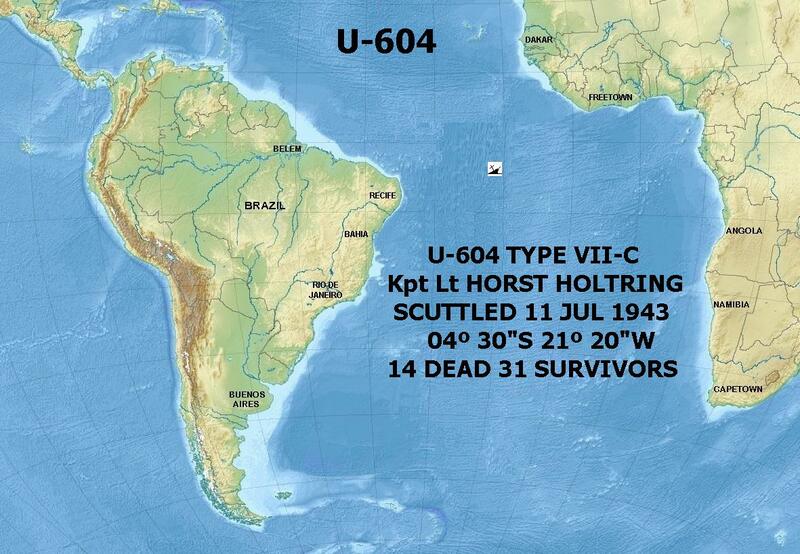 When sub was sighted it had started a turn toward plane to minimize its silhouette. Upon seeing that plane had sighted it, completed 1800 turn - putting beam to plane and unmasking battery. Pilot utilized small piece of scud about 5 miles distant in the direction of sub at 1200 feet for cloud cover. Plane was rolled over behind this and squared away for attack, going through the scud at 265 knots. As soon as plane was within approximately 4 miles sub opened fire. 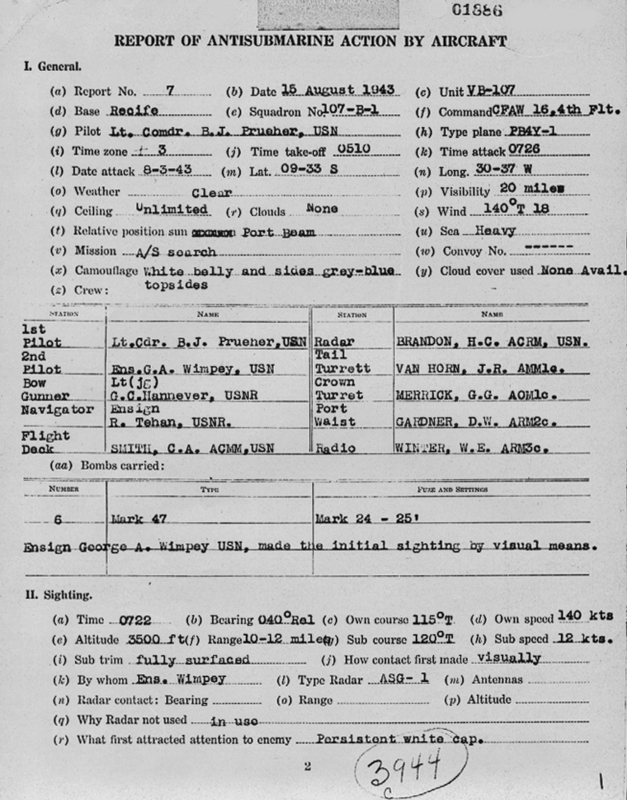 When under one mile plane fired sighting burst and then put sub under heavy .50 cal. fire. Shortly thereafter sub stopped firing and plane passed over slightly forward of conning tower at about 50 feet. (Sub guns were observed to be abandoned at this point) Drop was made, No. 1 exploding about 50 feet short, No. 2 apparently hitting sub and not exploding, No. 3 about 110 feet over and No. 4 about 195 feet over. Sub slowed but continued to move until after it had gone about 300 yards when No. 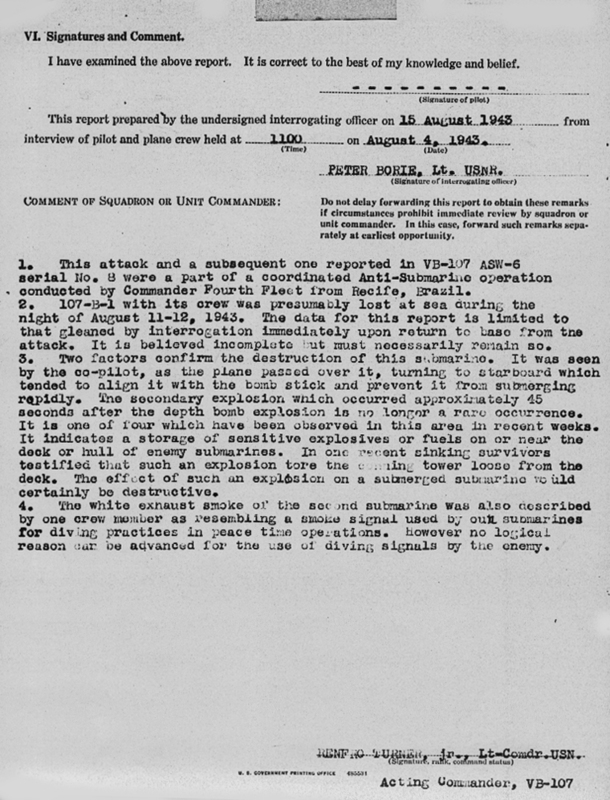 2 bomb apparently was dislodged and a violent under water explosion was observed midway between conning tower and stern throwing water about 200 feet in air. Sub sank slowly, level, and continued slowly ahead. Emission of three large air bubbles accompanied by oil indicated the sub to be still in motion and changing course 900 to the right. 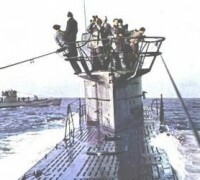 The sub then broached bow first, conning tower awash. While in this condition plane made another strafing attack (at termination of attack) and sub continued to change course slowly to the right and lose way. 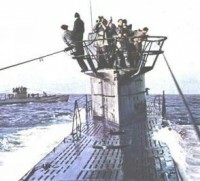 Sub then sank slowly stern first. Three more large air bubbles were emitted showing sub still moving very slowly and on a course the reverse of its original. Stern then broached, conning tower never quite coming out. Sub stopped as stern came out at a higher angle exposing rudder and screws. Stern continued to elevate, screws stopped and submarine became dead in water. Sub remained in this condition for approximately 3 minutes and then slowly slid down out of site, leaving oil slick and a stationary air boil which persisted for about 15 minutes.